I have just spent the morning printmaking. There is an upcoming exhibition with the theme "Trees" and although I don't usually do trees I thought it would be fun to have something to submit. 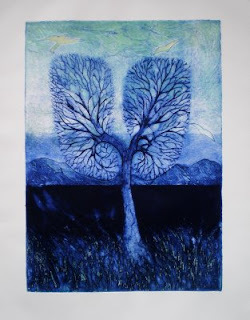 I also wanted to create a piece with a slight ecological twist and because trees breathe I decided to combine lungs and a tree shape and put it into a landscape. Here is the result so far. Below the image you will find the process described. The picture doesn't show up all the colours that well however after proofing it twice I am now reasonably happy with it. Here is the process I used for making a collagraph print. After drawing out the design on mat board I cut into the trunk and branch areas where I wanted the shapes to be raised. Remember that in the printing process everything is in reverse. Anything cut deep into the printing plate becomes raised after printing and the raised areas of the plate become deep, plus the image is reversed. I then built up the landforms and added carborundum where I wanted the very dark area. Once the plate was finished and had been covered with shellac to seal it I was ready to ink it up. The first colour was deep blue which went over the whole plate filling all the cracks and branches. After wiping off most of the blue ink then I rolled over the whole plate with a transparent green and then followed up with another roll of light creamy orange. This last colour I will make stronger next time I print it to bring out the definition more and to warm the whole thing up. I need a good name for this work. Any ideas ? Just as an afterthought, I have trouble deciding how to spell things in these posts. Should I use the English spelling of words or the American way now that I am living in the US. Somehow I just couldn't bring myself to write colour as color today. Perhaps another time.